QT’s new Perth outpost sets the scene with a moody palette and a touch of cinematic glamour. The playful QT hotel brand has earned a reputation for embodying the personality of its locale. So I’m puzzled when I walk past a black-clad ‘director of chaos’ (QT meet-and-greet staffer) into the 184-room new build that is the first QT on the west coast. Chic, obviously design-oriented and overwhelmingly black, QT Perth murmurs, rather than shouts, sophistication and flair. The darkness gives it a moody, understated feel, like a glamour girl sitting in the corner wearing oversized black sunglasses, hoping no one will notice her. It’s arresting, if a long way from the light-drenched, upbeat, beach-loving city I’ve perceived while spending the past 12 years here. Perhaps it’s where Perth’s headed, or what it wants to be? Yet as I wander up emerald-carpeted stairs, I spy subtle elements that whisper Western Australia. Crimson wallpaper is decorated with kangaroo paw wildflowers – in steel. It leads to Santini Bar, where a gold bar that gleams like a slab of bullion is further blinged with more zany wallpaper: this time black, and the silver flowers are melting. Hello, WA mining boom. QT public space designer Nic Graham wanted to reflect the excess of 1980s, Bond-era Perth (that’s Alan, not James) with a touch of cinematic glamour (the site once hosted a Greater Union cinema). Goal achieved. Crossing the hall, Santini Grill restaurant leverages Perth’s abundant natural light. Large windows face terracotta lamp shades that lead the eye to a tapestry-like cloud scene on the ceiling. Better still, the modern Italian fare, be it tuna belly tartare kicking off dinner, or goat’s cheese-topped scrambled eggs in the morning, is excellent. Heading to my spacious room, a black cockatoo print graces the hall – another WA nod. Crossing local jarrah floorboards, I’m told the plush seating’s hues of green and purple relate to the state’s wine regions. There’s more purple on the glam velvet headboard, ribbed in an Art Deco bent echoed in a crushed glass bedside light and polished brass touches. I’m on the 12th floor, pointing south, and the city views are captivating. The hotel’s location is its secret weapon: it’s a minute from the drinking and dining hub of the historic State Buildings, and just 600 metres from both the waterfront precinct, Elizabeth Quay (from where you can ferry to Rottnest Island) and Yagan Square, the new pedestrian zone that leads to small-bar central, Northbridge. I elevator to the 18th floor, where Perth’s highest and arguably hottest rooftop bar gazes over the metropolis. The immense blue sky shines into a bar coloured like the Kimberley: turquoise tiles meet an earthy, ochre rim, an airy floor and lively open-top corner. Now I feel like I’m in WA. Retreating to the pleasure of free new-release movies, a hooded black robe and a cheeky room service burger (amazing), I sleep like a baby. QT Perth may not be the breezy oasis I’d been expecting, but it’s definitely somewhere I’d like to stay again. A brilliantly located hotel in the city’s heart, overflowing with captivating surfaces beneath dim lighting and plenty of curious design choices to ponder. How could you not love the brass fixtures? 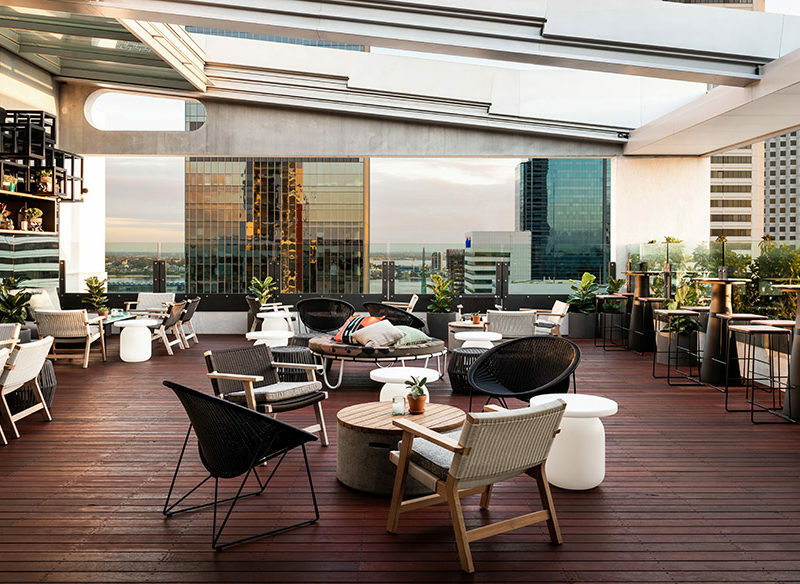 The cool-as-ice decor with subtle nods to parts of Western Australia, and the breezy rooftop bar on level 18. An upward glance, smile and “hello” from busy/distracted staff in reception and the restaurant would go a long way to making guests feel visible and welcome.